COMVEST’s renovation of the historic White Pillars Restaurant is officially underway and the $2 million project has the Mississippi Gulf Coast is ready to welcome back an old friend. COMVEST has developed a White Pillars Facebook page for the restaurant’s former guests and staff to track the renovation project as well as share their White Pillars experiences. 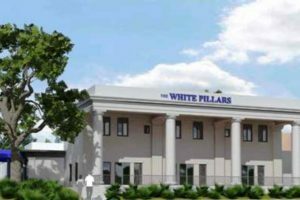 This video tribute to the Biloxi landmark beckons: “Everybody from New Orleans to Mobile has a White Pillars story…Check out ours and share yours…http://www.facebook.com/WhitePillars “. The Mississippi Business Journal explores the secrets to COMVEST’s success. COMVEST Properties, LLC was pleased to be the corporate sponsor for a sustainability symposium held at Harvard University in April. Organized by the Harvard University Center for the Environment, the Harvard Office for Sustainability, and the Real Estate Academic Initiative (REAI), the event gathered faculty, students and alumni for a multi-school conversation about sustainability and the built environment. COMVEST’s founder and senior managing member, Brooks Holstein, completed the Harvard University Graduate School of Design Advanced Management Development Program in Real Estate in 2006. Since that time he has been an active participant in many of the University’s programs and events. In 2009 he was named to the REAI Alumni Advisory Board, a volunteer organization dedicated to improving the quality of real estate research and education at the University. Ted Carter, of the Mississippi Buisness Journal, discusses distressed retail centers with Brooks Holstein and other Mississippi CRE pros. COMVEST’s Brooks Holstein served as a panelist, garnered attention with a bold prediction and discussed returns on going “green”.